Join us for a Park Clean Up Day: March 21st Join your neighbors for chats, snacks and community involvement on March 21st, 9am-noon. Help keep our newly-renovated Noe Valley Rec Center and Park clean! Enjoy time with your neighbors, some snacks and a bit of hard labor as we clean up Noe Valley Rec Center and Joby Dog Run. There will be a Park and Rec gardener working with the volunteers to help direct our efforts. Contact Laura Spanjian for more information: lspanjian@yahoo.com. Friends of Upper Noe Dog Owners Group will be leading a clean up of Joby’s Dog Run on March 21 beginning at 10 AM. For more information on the Joby’s Dog Run portion of the day, contact Chris at chris@noevalleyreccenter.com. Join the Rec and Park Department for a Neighborhood Community Meeting: March 17th, 7-8 PM The Rec and Park Department is now offering quarterly meetings in each Neighborhood Service Area so that the public can become acquainted and discuss issues with key RPD staff members. 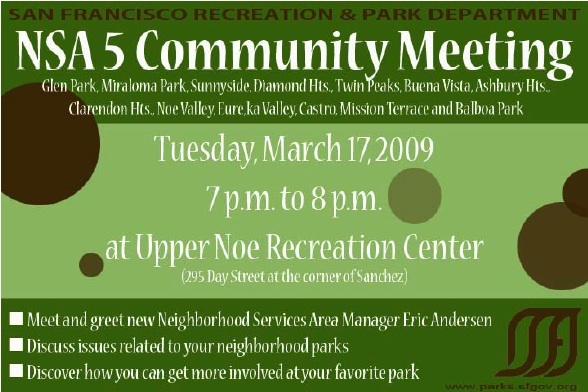 The Upper Noe Rec Center is in “Neighborhood Service Area 5 (NSA5)” and our area’s quarterly meeting is March 17th, 7-8 PM, hosted at Upper Noe Rec Center. We recommend you attend these meetings for the opportunity to talk with the Park Section Supervisors who oversee gardening staff and help submit work orders for park repairs, the Custodial Section Supervisor, and the Recreation Section Supervisor. It is also likely that Rec and Park department will invite capital program staff on hand to talk about park projects (if applicable). We urge all interested members of the community to attend these meetings and speak up about your park areas! Meeting with Eric Anderson, New regional manager for San Francisco Rec and Park departmentIn late February the Friends of Noe Valley stewardship committee met with Eric Anderson, the recently hired regional manager for the Rec and Park department. As regional manager, he oversees the Upper Noe Valley Rec Center, as well as dozens of other small and large park facilities. The meeting started with a focus on an introduction to the Friends of Noe Valley Rec Center and how we are interested in facilitating two-way communication between the Rec and Park staff and the community that uses the Noe Valley Rec Center. The Neighborhood Parks Council invites you to your upcoming area workshop on open space! This meeting is part of a series of approximately 20 community workshops led by the Neighborhood Parks Council (NPC) and the City’s Open Space Team. The works hops will solicit the public’s vision and priorities for the future of open space in San Francisco. This community engagement process seeks to initiate creative thinking about key issues impacting existing and future open space in San Francisco neighborhoods. Community input will inform open space policy for the city of San Francisco. NPC also hopes to encourage participants to serve as advocates for quality open space in the city. Click here for the full workshop schedule and meeting details. Update from Lisa Seitz Gruwell, new Rec and Park Education, Outreach and Customer Service ManagerRecently Alexandra Torre spoke with Lisa Seitz Gruwell, who is the new Rec and Park education, outreach and customer service manager, and she informed her that last week they rolled out new hours and staffing for all full-service rec centers (include Noe Valley Rec Center). Staffing: Lisa said that they expect Noe Valley Rec Center will have 4 full time employees. follow as soon as changes are announced. Rental: Lisa said that a new Permit and Reservations Director has been hired as of last week, and that she expects the permits process to receive some improvements in the near future. Please join the Department of Public Works and all of its community partners on Arbor Day, Saturday, March 14th from 9am to 2 pm as we celebrate the completion of 25,000 trees being planted in San Francisco. The kickoff celebration and ongoing community events will be held on Sunset Boulevard between Pacheco and Ortega. Volunteer activities include: planting 300 trees along Sunset Blvd. , doing tree maintenance, creating a native plant garden, and much more! Be sure to stick around to enjoy the Green Resource Fair: learn how to green your home and city; check out youth activities, tree inspired story time, music, food and more. Thanks for your interest and support of Your Park! Please contact us with any questions or suggestions. Please forward this newsletter to friends who use the Noe Valley Rec Center. We want this newsletter to help build the park community — please help us connect with members of the community.